The top-paying college majors earn $3.4 million more than the lowest-paying majors over a lifetime. Two of the top highest paying majors, STEM and business are also the most popular majors, accounting for 46 percent of college graduates. STEM (science, technology, engineering, and mathematics), health, and business majors are the highest paying, leading to average annual wages of $37,000 or more at the entry level and an average of $65,000 or more annually over the course of a recipient’s career. The 10 majors with the lowest median earnings are: early childhood education ($39,000); human services and community organization ($41,000); studio arts, social work, teacher education, and visual and performing arts ($42,000); theology and religious vocations, and elementary education ($43,000); drama and theater arts and family and community service ($45,000). The interactive web tool below allows the user to see how much college graduates earn by 15 major groups and 137 detailed major subgroups nationally and within states. State data is available only on the interactive tool below. We found that among college graduates with the same majors, earnings vary by state. For example, business is the most common major, accounting for 26 percent of college graduates. But business majors’ earnings vary across states. In California, business majors earn $70,000 annually on average; in Illinois and New York, they earn $67,000; in Texas, they earn $65,000; and in Florida, they earn $54,000. In this video’s Q&A — Dr. Anthony P. Carnevale, the center director and the report’s lead author, and Laura Barbier Vieira, the center communications associate, talk about the difference in majors’ earnings and the factors a student should consider when choosing a major. In the video Dr. Carnevale provides advice and highlights key factors from the report. Laura is worried picking a History major may lead to low earnings but Tony assures her, that is not the case. Watch the video to learn how History majors can earn more than the average business major and much more! Discover the key statistics in our report pertaining to college majors and earnings in this infographic. 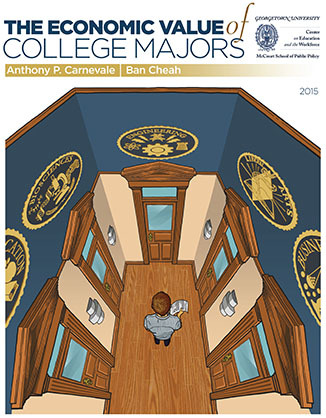 The importance of a major is powerful. 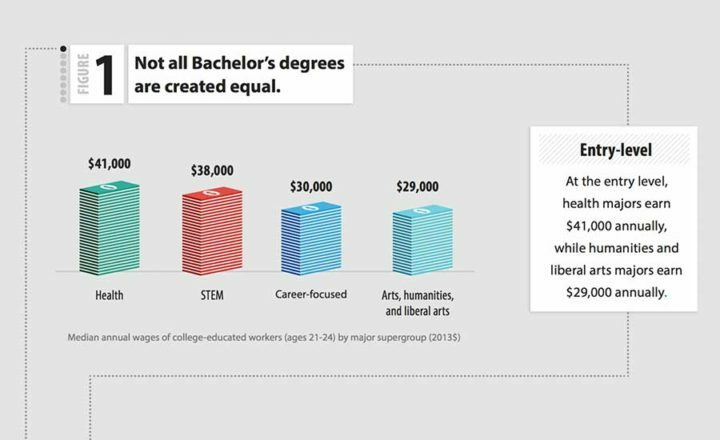 So much that Bachelor’s degree holders in some majors can earn more than those with a graduate degree. We found that the highest-paid majors were among the STEM (science, technology, engineering, and math) fields, and the lowest earning majors were with early childhood education and human services and community organization. The full report includes a more detailed analysis of the popularity of majors and educational and labor market outcomes by major. * Following publication, the title and subhead of Figure 3.58 on page 95 was updated to reflect the correct information.